I doubt it’s news to anyone reading this blog that Wizards of the Coast is reprinting the classic TSR board game Dungeon! For those not familiar with the game, which first came out at the dawn of D&D in ’75, it’s a straightforward old American-style boardgame just dripping with old-school flavor. Players send colorful pawns representing various Chainmail-type characters (an elf, wizard, hero and superhero — note how we’ve got PCs of different experience levels adventuring together!) into the depths of a dungeon full of traps and secret doors. There they draw cards representing monsters encountered, roll dice to defeat them and draw treasure cards. Magic item cards help your PC win fights or explore more efficiently, but it’s monetary treasure which helps you win — you need treasures of a high enough GP value, and you need to escape with them alive! It’s amazing how well the gameplay lines up with the OSR playstyle. Killing monsters is fun, but taking their wealth is the only thing that really matters. And while the PCs don’t form a party — you’re in competition with the other players — dealing with other PCs is reminiscent of dealing with rival adventuring parties or active dungeon factions in old-school Caves of Chaos-type play, where you watch NPCs fight each other and hope to swoop in on the weakened victor to make an easy score. What really appeals to me about the WotC re-release is the price. Whereas other companies’ recent re-releases of classic 70s and 80s games, like Steve Jackson’s OGRE and Games Workshop’s Talisman, had hefty three-digit price tags, the new Dungeon! reprint is listed as a cool $19.99. This looks like a serious effort to market the game for a new generation of kids, rather than as a cash-grab from nostalgic fortysomethings. I hope this works; Dungeon! can’t compete with today’s best Euro-style boardgames for quality of play, but it’s head and shoulders above its “classic” American competitors like Monopoly or Sorry! or what-have-you. It’d be nice to buy a few copies for my various nephews… maybe it’d encourage them to play D&D with their uncles when they’re older. A common theme in the old-school renaissance is that there was a “Hickman revolution” that ruined everything in the development of D&D. There is no doubt that the TSR modules Tracy and Laura Hickman helped create sold like crazy because they met a demand that hadn’t previously been satisfied, that this commercial success helped set the publishing priorities for the expansion of the RPG industry, and that we are still experiencing the consequences. 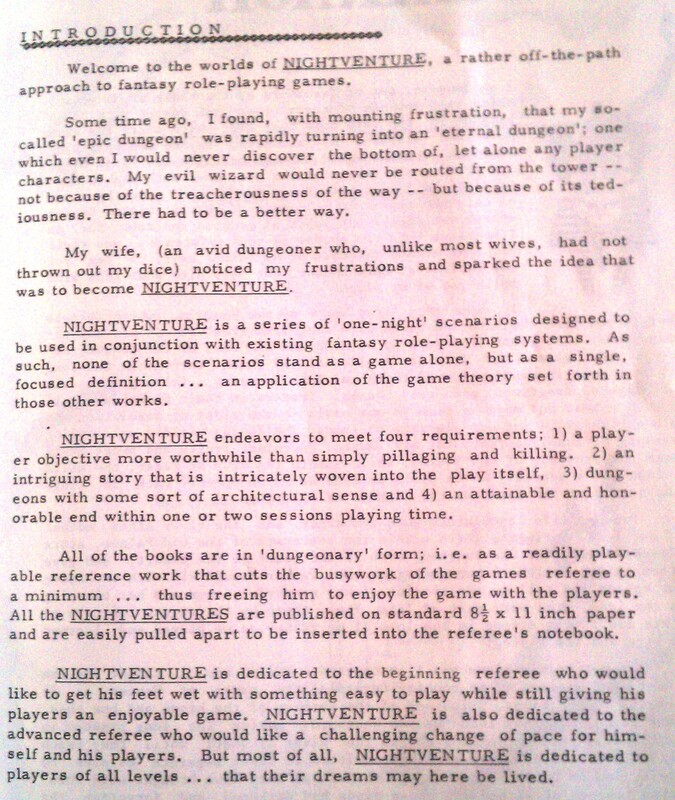 The first two of the four requirements that NIGHTVENTURE endeavored to meet – a player objective more worthwhile than simply pillaging and killing; an intriguing story that is intricately woven into the play itself – certainly can be seen as containing the seeds of what we now know as the “Hickman Revolution”. The fourth – an attainable and honorable end within one or two sessions playing time – speaks to one of the creative tensions that emerged with the Dragonlance series. Many gamers wanted and still want to strive toward an end that will provide a satisfying dramatic resolution to the events being played out. At the same time, as genre fans, we always want more of the same. Our desire to have the adventure continue on and ever onwards led as surely to the trend of sequelitis which Dragonlance came to exemplify as did TSR’s commercial motivations in feeding that desire. It is interesting to consider whether an independent Daystar West Media would have maintained the goal of having an end never more than a few sessions away, and whether a Hickman revolution and OSR-style counter-revolution would still have occurred if so. 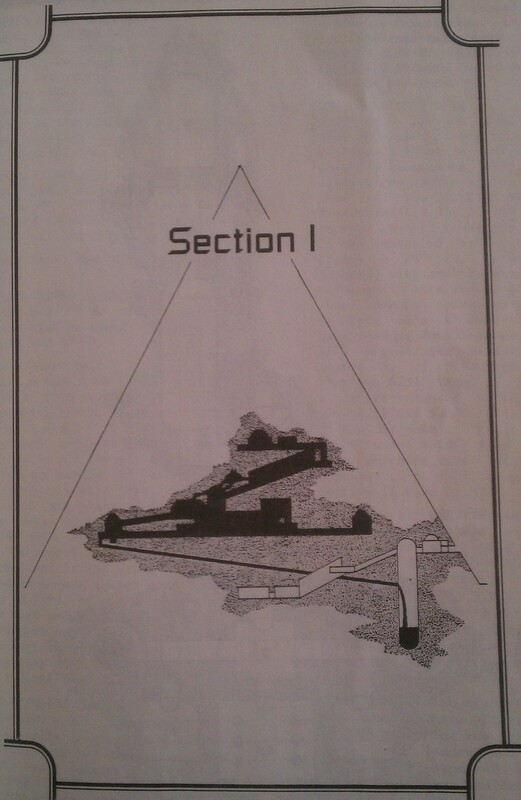 Some of this architectural sense is visible in later Hickman modules like Ravenloft, but the layout, cartography, and visual presentation in Daystar West’s version of Pharoah is, to my mind, far superior to that in its later TSR release. I think that this idea of complex, fantastic architecture is the virtue that the old-school renaissance is most ready to celebrate – it’s certainly one of the things that I admire so much in Paul Jaquays’ work. Might there have been a different kind of Hickman revolution if more people had been exposed to this virtue of architectural sense, both by having it stated directly and elegantly displayed?